An East Wind Brings Rain? About halfway through the morning, two bicyclists pedaled by and I overheard one of them say to the other: “Well, you know an east wind brings rain and rain brings cooler temperatures.” I knew that the comment was meant as encouragement because I had looked at the days route map and it showed virtually all of our 81-mile day's ride was headed directly east. And at that point the temperatures were starting to warm up and that old east wind was warming itself up, too, to get ready for a big blow. And blow it did. The terrain was fairly flat and the landscape virtually treeless. There was nothing to break the wind's force and very few downhills to give a break. Even if there was a downhill a lot of those stretches still required lower gears to compensate for the wind's force. We encountered one significant downhill into the Des Moines River valley at Lehigh, about 18 miles from the end. Of course, that was immediately followed by a very long, steep uphill climb, the biggest hill we've seen so far on this year's RAGBRAI. I was thankful for the shade and break from the headwinds, although I was gasping for air by the time I made it to the top. A few miles after that there was another hill almost as big as we dipped into and out of the Brushy Creek valley. And then it was just more of that grueling grind headed into the east wind. The route map showed a turn about 5 miles from the end town onto a road that headed north. I thought I would never see that turn but when it finally appeared up ahead I practically cried tears of joy. I knew the hardest part of the day's work was done. Sounds as if that east wind cold compete with or recent “haboob” storms. Those steep hills must be quite a challenge. 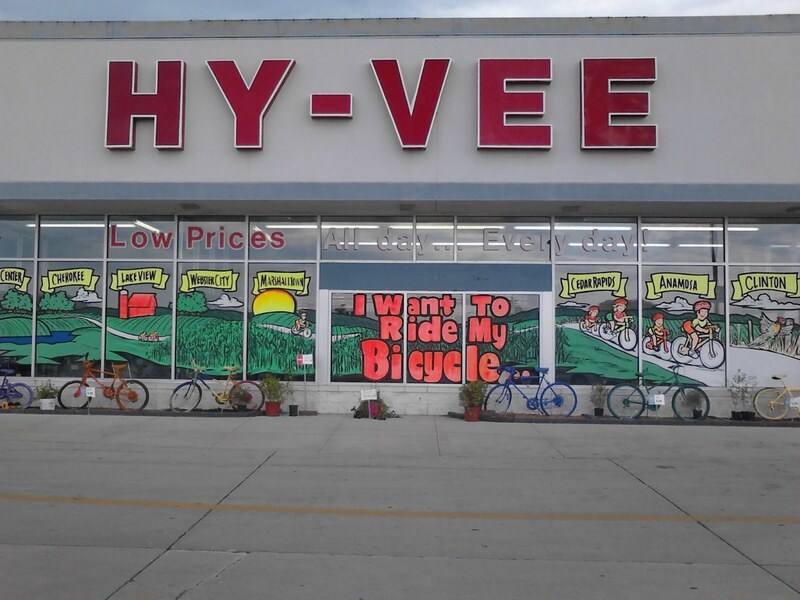 Glad to see a Hy Vee store as I've heard of them from some neighbors.